The Roman historian Livy wrote about Hannibal. 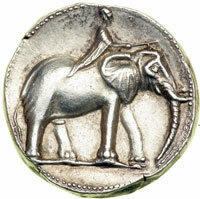 One of Hannibal’s coins shows a man riding an elephant. Livy was a Roman historian who was born in northern Italy about 59 BC, in the Late Republic, when Julius Caesar was just beginning his career. Livy moved to Rome and wrote his books during the reign of the first Roman emperor, Augustus. For a while, he may have been the history teacher for the young Claudius. Livy wrote an account of the history of Rome from the beginning of the Republic in 509 BC to the reign of Augustus, in 142 books (we would call them chapters today). Unfortunately, most of the books Livy wrote have been lost. Nobody copied them over, and the original books fell apart or were thrown away. We only have 35 of them left, in copies that monks made in the Middle Ages. But these books tell us a lot of what we know today about the beginnings of Rome and the Punic Wars. What was Livy’s main point? Livy was especially interested in showing that people won when they were good, and lost when they were bad. Mainly, Livy shows Romans as good and their enemies as bad. For instance, he shows the Carthaginian general Hannibal as sneaky and savage, while Scipio, the Roman general, is honest and merciful. That’s not because Hannibal was really bad and Scipio was really good; it’s just what Livy wanted us to see, because he was a Roman like Scipio, and because he liked a story to have a good moral lesson. Probably both Scipio and Hannibal were good, strong leaders, or they wouldn’t have been so successful. Livy lived to be about eighty years old. He died during the reign of Augustus. Cite this page: Carr, K.E. Livy – Roman historian – History of Rome. Quatr.us Study Guides, September 3, 2017. Web. April 20, 2019. Thanks! Sorry about the mistake. I’ve replaced it with images of Hannibal and Scipio. Hope you approve.